If you’ve got frizzy hair, wavy hair, curly hair and simply want to smooth it or even straighten it then this service is for you. The nonchemical system takes from 4 hours to carry out but lasts up to 6 months. Your hair will be left sleeker and shinier, less likely to absorb the damp moisture during the winter months and damp humidity in the summer months all resulting in easier to manage hair. You’re blow dry time will be reduced and your straighteners can take some time off, yep you won’t need to use them on your hair anywhere as near as much. All sounds appealing doesn’t! AFTER: The Nanokeratin System has provided this guest with shiny, smooth sleeker hair that has had NO STRAIGHTENERS on after blow drying. 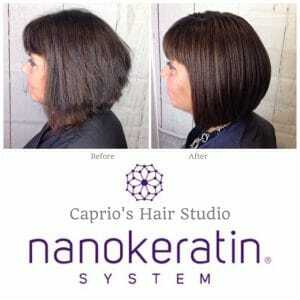 MAINTENANCE & AFTERCARE: On having the Nanokeratin system done in the salon you will be provided with the aftercare products you need to maintain your hair. Simply Cleanse, Condition and Insulate the hair as often as you would do normally and its as easy as that! You can choose to have either a smooth system or a straightening system depending what result you want. Some guests like the volume they already have and so don’t want to flatten their hair, sometimes want to still wear it wavy or curly in which case the smoothing result is for them others want to reduce the volume and always wear their hair straight in which case complete straightening is for them. Our Nanokeratin specialists will explain this more in-depth during the consultation. The service takes a minimumof 4 hours to carry out and cost from £231. The price can differ based on the length and thickness of the hair as this has a time implication. If you divide the cost by the longevity and reduced blow-dry time it takes you to get smooth hair then it’s a no brainer. 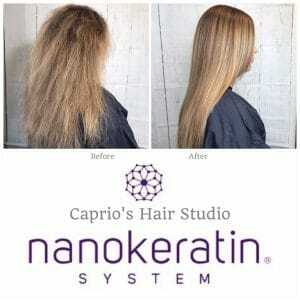 If you’d like to know more about Nanokeratin then please either call us or book a Nanokeratin Consultation via our online booking facility, our Nano specialists Jess and Emily will be more than happy to talk you through the process and help you decide if this service is for you. We look forward to seeing you in the salon soon. © 2018 Caprios Hair Studio. All Rights Reserved.